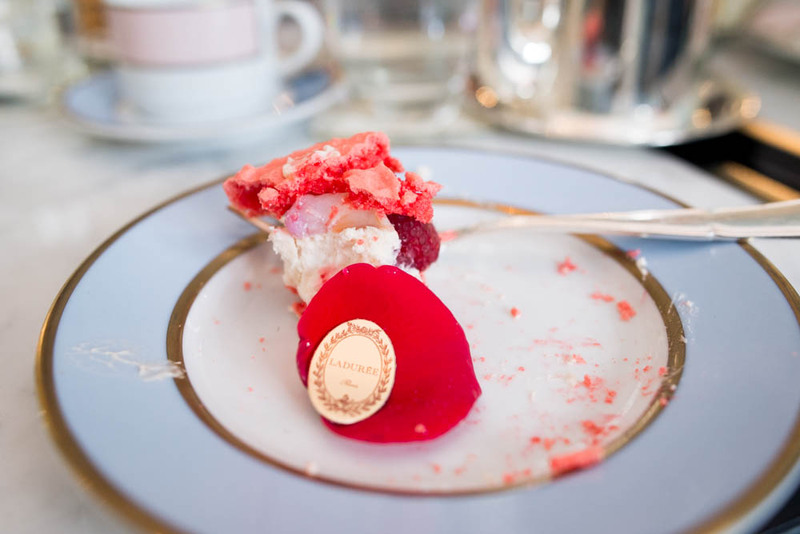 I have been waiting a very long time for the opening of the second location of Laduree. After so many months of anticipation, the colorful wood boards on the front of the West Broadway store front finally came down and so start many future trips to Soho to fulfill my macaron cravings. 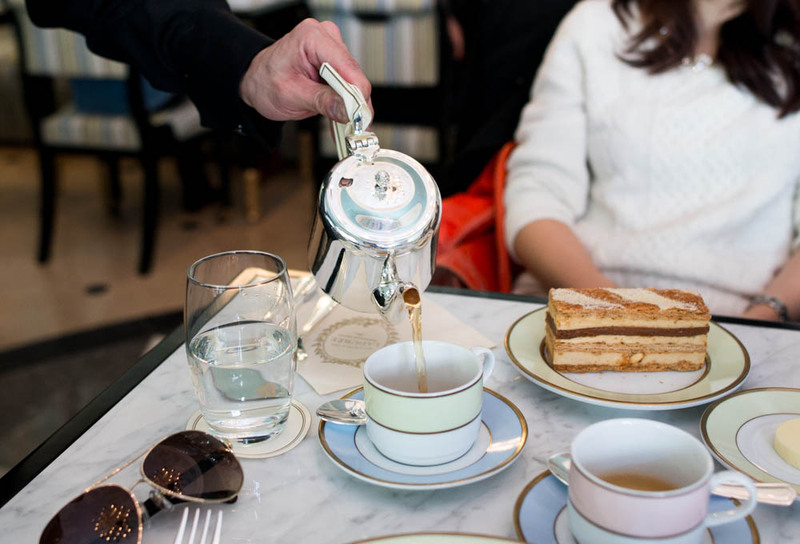 What makes the Soho location of the French classic even better than its UES sister location is the addition of a restaurant and tea salon to properly enjoy macarons and desserts with a pot tea. Such a special spot calls for a ladies’ Sunday tea with JL, DC and SB. We made a reservation only a week or so ahead of time so were able to skip the rather lengthy wait on a busy Sunday afternoon. The elegant dining area is divided up into two sections, one cozy and dark and another bright and light filled in the back. We were luckily seated in the center of the back room which faces an outdoor garden that is still a work in progress so for now, only a large board depicting a sketch of Paris. We all started with our very own pot of tea from an extensive list filled with varieties on the classic black tea such as a rose and citrus The Marie Antoinette and a cinnamon and cardamom The Othello. Each were steeped in a personal silver pot and poured carefully by our waiter. Because it was around lunch time, we decided to start with a few savory bites before diving into the desserts. 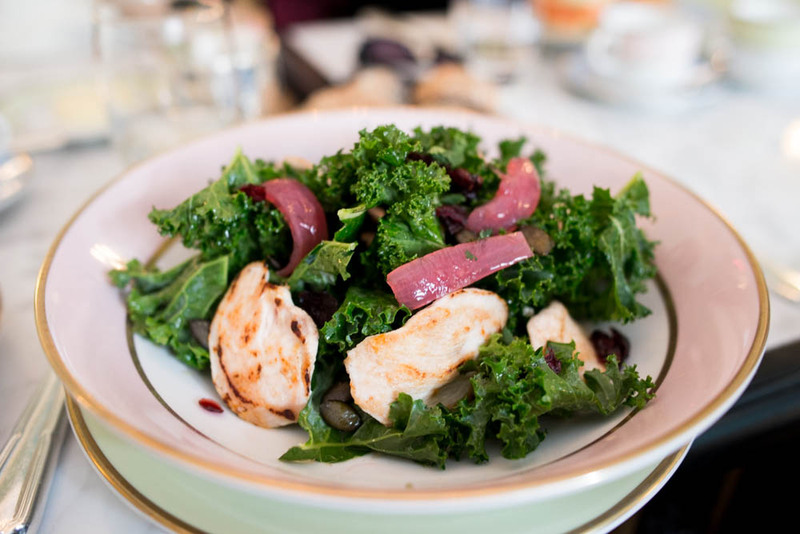 SB and DC split the smoked salmon club sandwich and the leafy kale salad with grilled chicken and red onions. 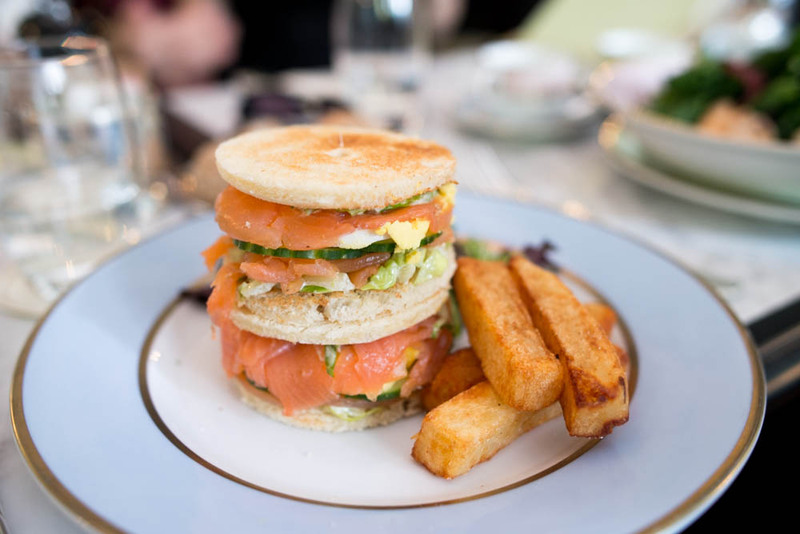 The sandwich was cut into adorable rounds and served with four thick cut fries that were crunchy on the outside and creamy on the inside. 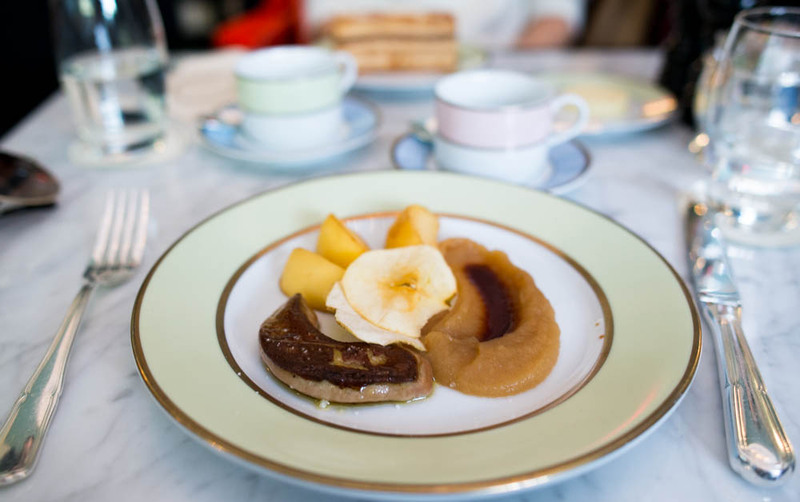 I had a hard time making up my mind and after much debate, I settled on grilled duck foie gras with a sweet apple puree and a balsamic reduction. The rich foie gras was beautifully seared and so rich that I was glad that the portion was on the smaller side. 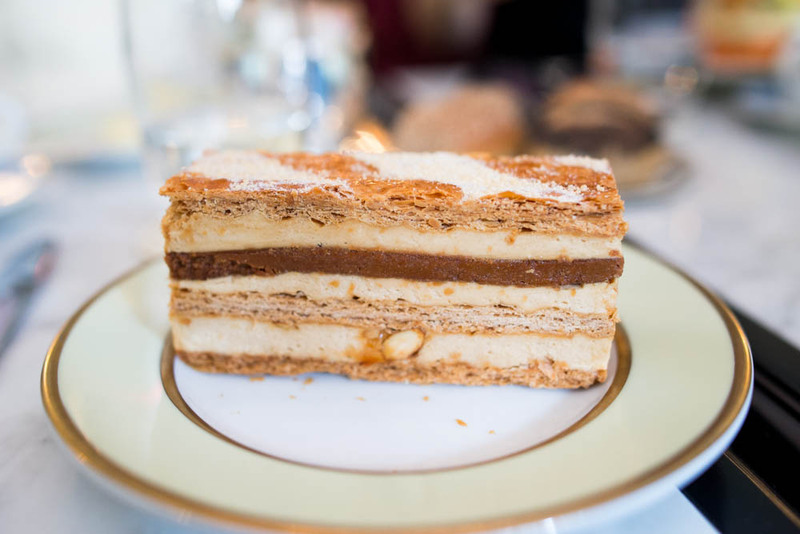 JL had a head start on us with the desserts and was already well into her Mille-feuille Praliné while the rest of us were working on our savory dishes. Delicate caramelized puff pastry was layered with praline cream, almond pralines and crunchy hazelnut. A single bite delivered so many different varieties of hazelnut and caramel that you had slowly savor the dessert. 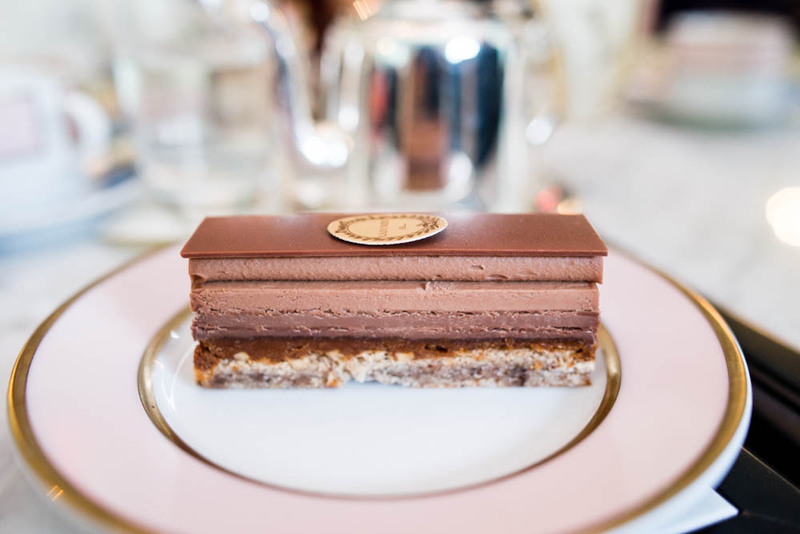 SB was also in a hazelnut state of mind but since they had just run out of the mille-feuille praline, she settled on a tiny bar of the Plaisir Sucré. This might look small but it was packed with even more layers than the mille-feuille praline! 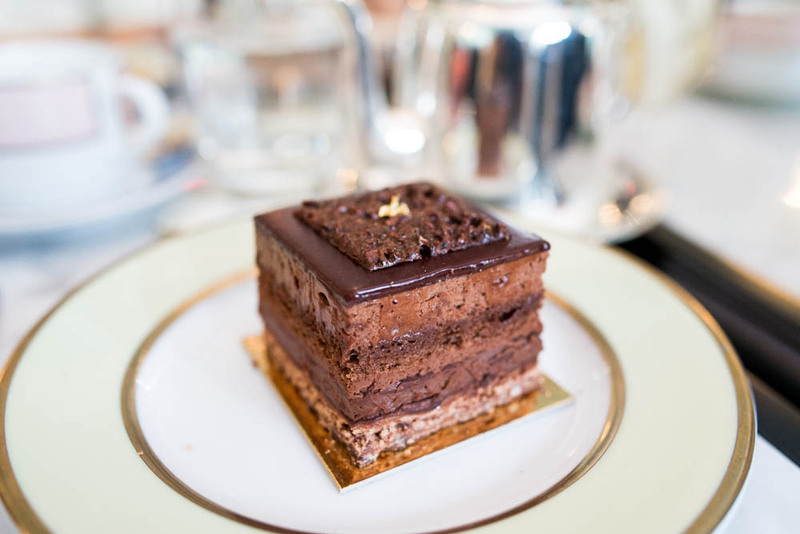 Dense and creamy, the hazelnut meringue sandwich cake had crushed hazelnuts, crusty praline, thin milk chocolate leaves, chantilly cream and milk chocolate. DC stayed on the chocolate theme and chose the Carre Chocolat, a dense and rich square of chocolate layers upon chocolate layers. Chocolate mousse, chocolate fondant, bitter chocolate ganache, and chocolate cookies, there is really nothing more a chocolate-holic can ask for in a dessert. Since we were already overloaded with chocolate and hazelnut desserts, I went with the Ispahan. Ever since I had this dessert in Paris three years ago, I have been dreaming about it. 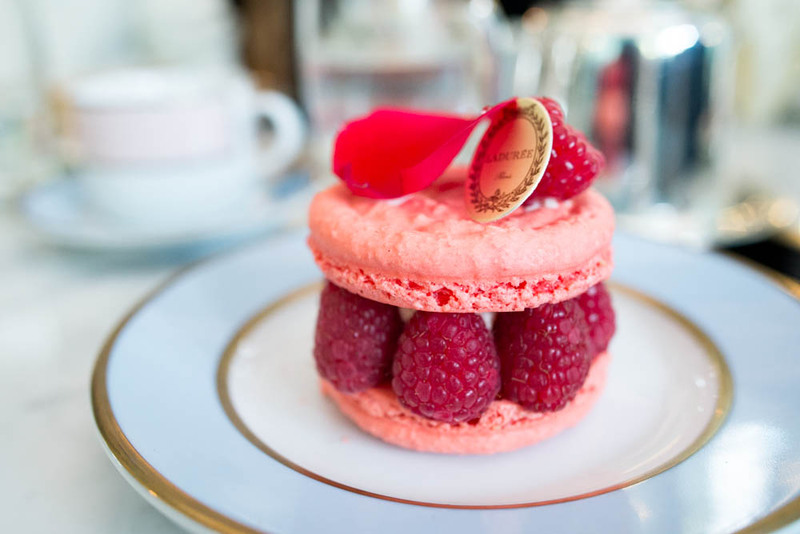 The Ispahan combines lychee, rose and raspberries in a light floral scented pastry. There is really nothing like it and one bite, I traveled across the Atlantic back into Paris. One last final bite to accompany the last few drops of tea. 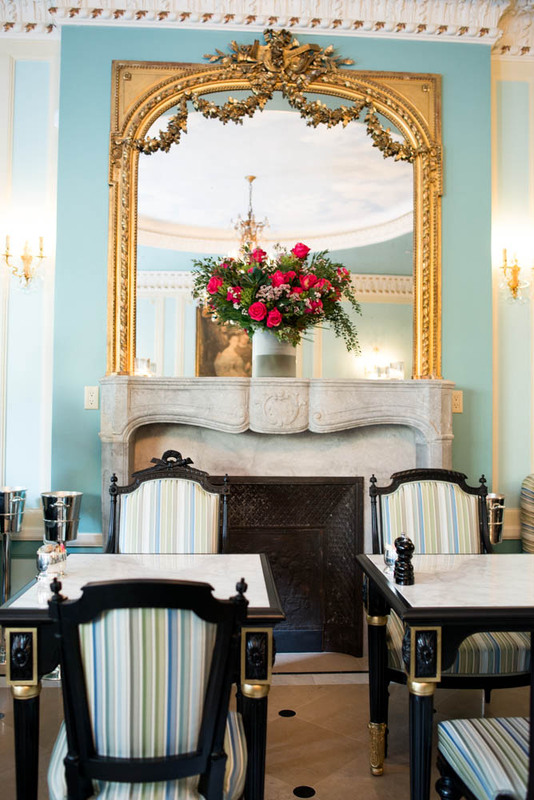 Now this is the right way to do a ladies’ Sunday tea, holding conversations leisurely over cups of fragrant tea with delicate desserts and pastries in an elegant setting.